We challenge you to determine the function of this protein! For more Functional Sleuth structures visit the PSI Structural Biology Knowledgebase. 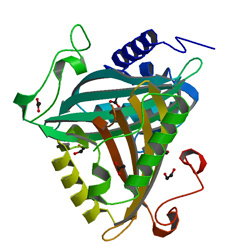 The Protein Structure Initiative provides supplemental funding to individual research groups that want to elucidate the activity of these proteins of unknown function. Click here to see the Functional Sleuths featured previously!